Never let the elements keep you from pursuing your passions. Introducing the HM50R rechargeable headlamp with its lightweight and indestructible body. Don’t let its small size fool you; this headlamp is power packed throwing a beam to a max range of over 250 feet. Its surprisingly long run time at lower settings and fantastic value makes it the perfect partner to take camping, hiking or running when your goal is to extend your day. ON/OFF: Press and hold the switch for 0.5 seconds to turn on/off the headlamp. Output selection: With the headlamp switched on, single click the switch to cycle through Low→Med→High→Turbo. Note: The headlamp memorizes the last selected brightness. When turned on again the previously used brightness level will be recalled. Uncover the anti-dust cap and plug the Micro USB terminal of the charging cable into the charging port of the headlamp. Once charging is completed, be sure to remove the charging cable and replace the anti-dust cap. The max charging current is 700mA, and the charging time is about 1.5 hours. The indicator displays blue when charging, and turns green when fully charged. The headlamp can only be used on Med output when charging. Warning: Avoid charging non-rechargeable batteries. The light will accumulate a lot of heat when used on Turbo output level for extended periods. When the light reaches a temperature of 65°C or above, the light will automatically downshift to High output to reduce temperature. Reset to Turbo if needed. When the voltage of the 16340 battery in use drops lower than 3.0V, the low voltage downshift function will be activated. In this state the headlamp cannot be used on Turbo output and will only cycle through High, Med and Low. The headlamp will automatically step down by a few lumens after being used for an extended period on any of the High, Med or Low outputs, to extend runtime and to guarantee illumination outdoors. Remove the tail cap and the battery, then remove the headlamp from the holder. Re-insert the battery and screw back the tail cap. Unscrew the tail cap to insert the battery with the anode side (+) towards the lamp head, then screw the tail cap back on. The headlamp holder is made of enhanced silicone, which gives it good anti-tearing ability and mechanical strength, and makes it resistant to low and high temperature, ultraviolet rays, acid and alkali corrosion. The material feels smooth to the touch and should not cause allergic reactions. If the headlamp holder needs replacing, open the tail cap, remove the battery and the holder, and replace with the new spare holder. Disassembling the sealed head can cause damage to the lamp and will void the warranty. Fenix recommends the use of only excellent quality batteries. If the lamp will not be used for an extended period, remove the battery, or the lamp could be damaged by electrolyte leakage or battery explosion. This headlamp is a high-intensity lighting device capable of causing eye damage to the user or others. Avoid shining the headlamp directly into anyone’s eyes. This is a great light. 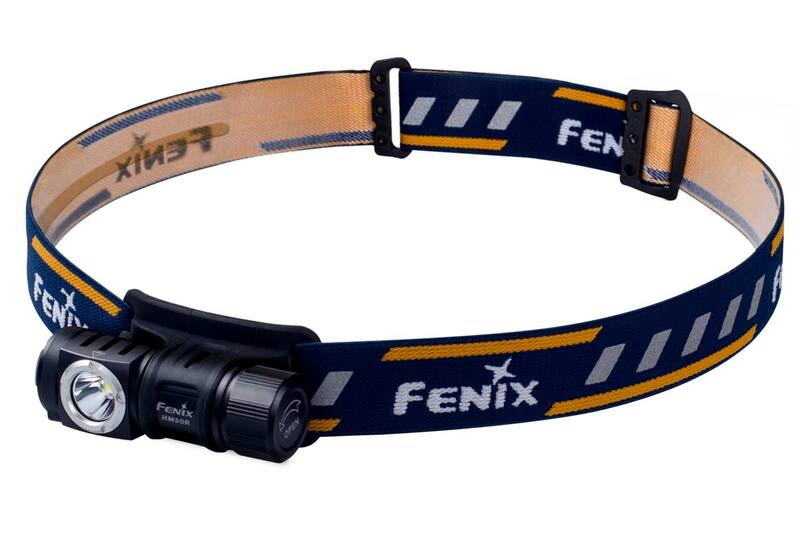 I’ve had many headlamps in the past but this is my first Fenix. I was turned onto it by a coworker. It has a great hybrid beam. At all levels there is a hot spot in the middle and then a very wide spread pattern. It is also super compact. I’m thinking of getting a couple more for the family. The head light has several settings and the illumination at night is remarkable. Also, light weight and very comfortable on your head. Excellent headlamp!!!! Better quality than the black diamond and petzel, imo. Very simple and usable features. Comfortable and great looking, too. I took back my black diamond spot and got this bad boy instead. Great purchase! Very bright, very compact and light weight, easy to charge, easy to install on helmet for riding my OneWheel. Excellent product! Awesome light, very bright, and well built! A great value for the price. Very durable and simple to use. Had this light on for hours in sub-zero weather and it was flawless. Indicator light said when it needed a charge and after a short charge up it was ready to go. I use this thing a lot – far more than my more powerful HL60 since it is much lighter. Excellent beam spread for working in low light or in the dark – just perfect! What I like about the HM50R is the simplistic design. Just four brightness modes with a big, easy to use button. When winter mountaineering, I always had to take my gloves off to operate my Petzl headlamp. When in freezing and precarious situations, it’s sometimes easy to get into different color and flash modes, which takes time to scroll through. (I don’t want all of these modes in a headlamp – I have them in my compact hand-held.) It is also very compact, feels durable and has a much better beam pattern (nice even fill) than other top headlamps I have owned. If this is what you are looking for, then Fenix has done a great job filling this niche. Great lamp at what I considered a reasonable price for what you get. Love the endless position rotation for beam rotation. This is a fantastic piece of kit and a great company to deal with. Buy this light; you won’t be disappointed. My favorite all-around headlamp for backpacking. Compact, relatively lightweight, mid setting is plenty bright. Best headlamp I have ever used after decades of using other name-brand headlamps. I’ve had low and high end head lamps. This one is a keeper for sure. Exactly what I was looking for in a headlamp for trail running. Great product. I just used this lamp on a one month bicycle tour. It is the BOMB! Great headlamp!!! Nice range from low to high, good battery life, really bright when you need it and so comfortable I would forget I had it on. I could also mount it on my bicycle helmet. It would be a perfect EDC if it had a clip. Headlamps keep getting better and right now this one is the best I’ve seen. Standard rechargeable battery, waterproof, very bright output, battery indicator, infinitely adjustable tilt angle, very light at 3oz for backpacking. Also comes with a 2nd sleeve for mounting the light somewhere other than the head band. Well done Fenix. Super bright! So far so good – we’ll see how waterproof it really is. This is a great light. It is light and simple to use. There isn’t a myriad of useless options and button pushing sequences to remember. I use this head lamp for running. Very light, well built, and very, very bright with simple controls. A must for my backpack. Only thing missing is a strobe feature, else perfect. This is a very nice compact headlamp. The USB rechargeable battery is a great idea. This is a great, reliable light. Designed for extreme conditions like mountaineering or long-term backpacking. However, I don’t understand how this ‘last-resort’ light is missing the signaling functions, for example, one short flash every 5 seconds, or sos. You don’t need those functions on ‘base camp’ lights like TK35UE. But you definitely need it on this one, because just in case! Would give a 5, but the flashlight auto dims after a short time on high. A very nice headlamp. Light weight and comfortable. The rotating light makes up close work easier. Light output is great for outdoor night time activities. Well made and looks like it will last for a long time. A good purchase. I am using HM50R almost everyday. I carry it all the time when I am at work because the working environment is not bright enough and I need both hands to work. It is great EDC headlamp for me. But I like the HL50 head bend clip. It can remove the lamp easily and you can redirect the light direction easily. I like HM50R turn on but not HL50. HL50 can turn on easily in your pocket and loose battery charge. I like HL50 battery choice. I also like LD15R’s light function. If the LD15R clip be removable then that will be very good. The USB charging port seems has a big gap. You can see the light coming out if the rubber plug is off. I crazy glue the rubber so there is no chance for water leak to ruin the light. We need all the good functions together and not separate to all 3 different models as we can not carry 3 lights. Currently I have all 3 and really hate those functions can not combined to one. I use the HL50 head bend and HM50R flashlight. I have LD15R but because of the permanent clip so I couldn’t use it on the head bend. Also the battery selection. I would suggest CR123,16340, or LIFePO4. should all be able to use and of course the adapter. I bought this specifically for running at night as it is very minimalistic and lightweight. I have been very satisfied with its performance. I usually run it at setting 3 which is just over a hundred lumens. This lasts over a week with my running schedule. This allows me to see all the ground about 20 feet in front of me to prevent myself from running into holes etc while not being too bright towards oncoming vehicles if I am running on a sidewalk. If I need it brighter the push of one button bumps it up to 500 lumens. I also run with a pd35 tac and use that if I want 1000 lumens to light up and Id something. My only complaint is that the beam is so wide that it slightly reflects off the top frame of my glasses no matter how high I mount the headlamp and even rotating the beam up some, granted the frames are a polished silver color so if they were a matte color maybe I would have different results. I dont ever have this issue with the hr60 but it bounces around too much and is front heavy for running. Another wonderful Fenix product. The band is well made, designed and styled, and the light itself is a pleasure to use. Very pleased with the purchase. Love this headlamp. Minimalist design yet versatile – loaded with all the function I want – and the Turbo mode gave me all the light I needed and more. The beam filled the confined space I was working – better than expected. Also, once I got used to the single side switch – I found it easier to use than my prior HL that had top-side switches. Best of all – the USB recharging is so simple and smart – I can charge it anywhere – and now I’m not constantly over-paying for CR123A’s. The Fenix HM50R checks all my boxes: lightweight and minimal/simple, bright, durable, versatile, and rechargeable! This is my new favorite tool. I love this light. I’ve used it camping several times already. I use it instead of my HL60 around the house and exercising outdoors due to the lighter weight. 500 lumens is more than enough light for me and so far it has worked flawlessly. Thanks Fenix for another awesome product..
Love this little light. Keep it in the console of my truck for emergencies. It, being a headlamp and hands free, has replaced the regular flashlight I kept there.